Hidden at the back end of a compound, at the side of a former warehouse, is a row of mostly soon to open establishments. As of writing, Toyo Eatery has only been operating for about a month. It is a beautiful space. High ceiling; open kitchen. 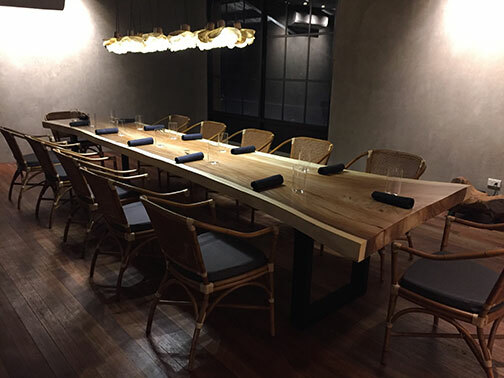 Unfinished concrete, warm wood and stainless steel are combined to create this deceptively simple atmosphere. The food ties in with probably the same description: deceptively simple. And while it positions itself as a “Filipino eatery”, it doesn’t go about it literally; no deconstructed kare-kare or adobo here. But it empasizes on techniques and familiar flavors. There are essentially just two menus. The Tasting (P2900) which is composed of 7 smaller plates. And The Set (P1000) which is composed of 4 courses, and also includes some starches. Our group that night chose to go with the Set, mixing up some courses for variety, and added some items a la carte. While waiting we were given some tocino bread. 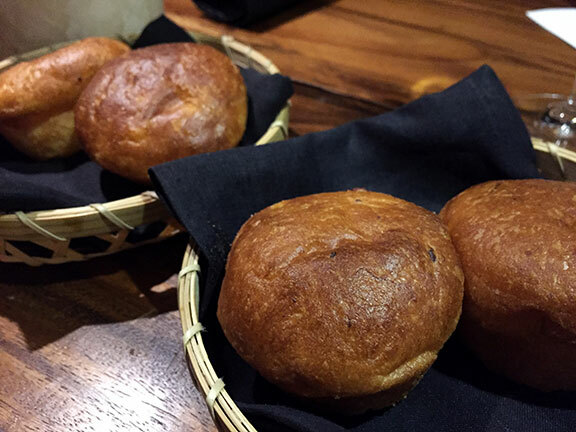 Greasy buns made with rendered pork fat and dotted with bits of the pink cured meat on the insides. A nice savoury start; and quite generous with the refills too. For the starters there was the Garden Vegetables; a signature dish and spillover from Black Sheep. Essentially all the vegetables mentioned in the song Bahay Kubo. 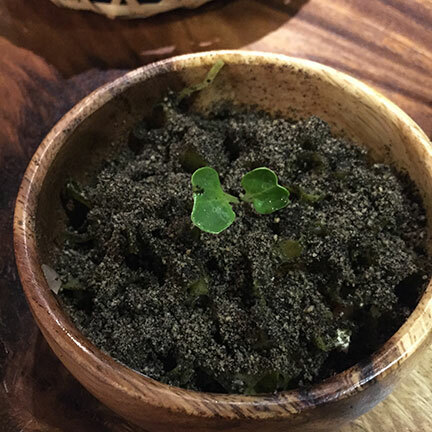 It looks like a tiny bowl of dirt but if you dig with your spoon you’ll find a relish of fresh vegetables underneath. Quite light and refreshing considering the dark first impression. 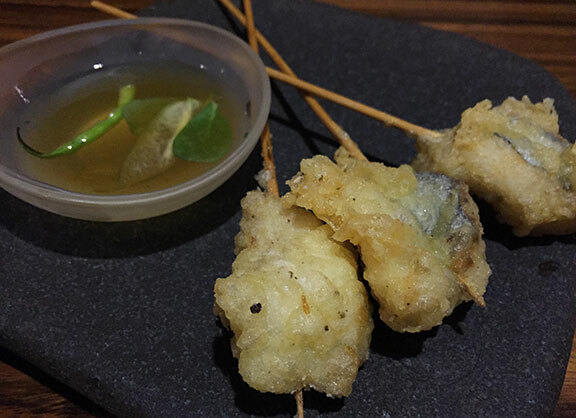 The espada tempura served with a very aromatic and fruity guava and kamias broth. Delicate bites, thin batter; though a tad oily. I was expecting a little more acid from the dipping sauce but it mostly provided fragrance and a touch of sweetness. 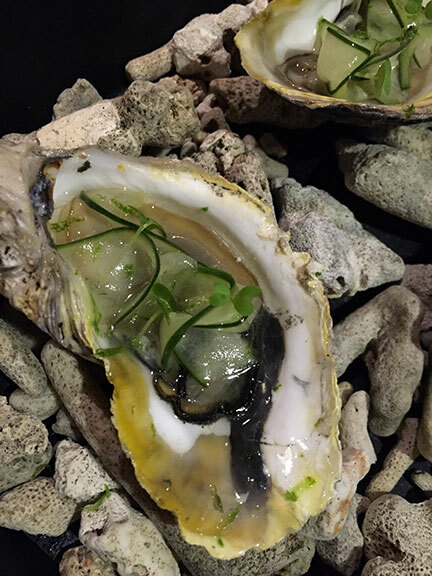 The oysters with pickled cucumber, lime and basi was quite surprising in that I though the pickling and the other components would cover up flavors; but it was still the taste of the oyster that came through. 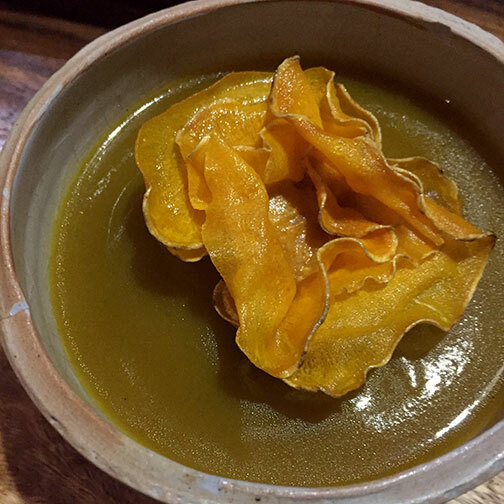 My favorite of the first courses was the burnt kalabaza with sea urchin and orange kamote. An unexpected explosion of flavors and textures. Crunch, silkiness, smoke, fat, salt, sweet, umami. 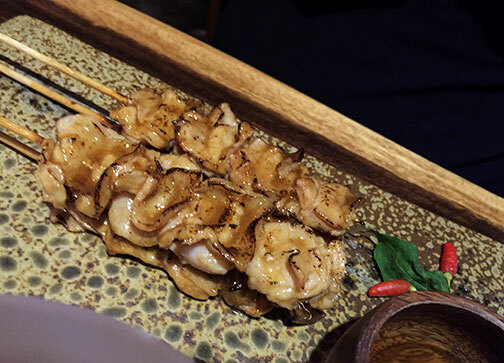 Of the second courses of the Set Menu, there is the option for the pork barbecue: slivers of shoulder, leg and belly carefully skewered to look like the street side grilled treats. And the grilled belly and loin of bangus. Bangus is not my favorite fish as it tends to be served crumbly and dry too often. 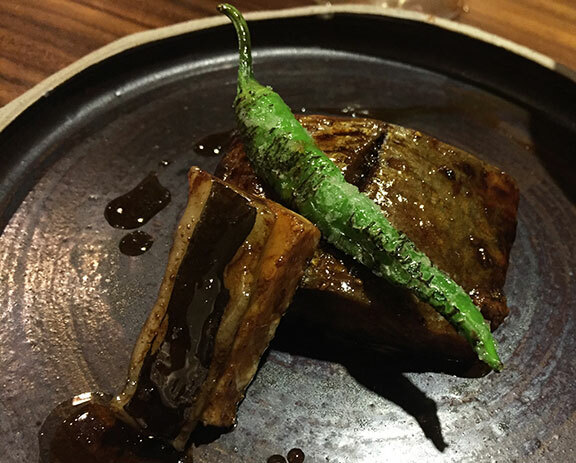 But applicable to both the pork and the fish courses, there is just this deftness and skill in grilling that brings out the succulence of the ingredients. The pork is tender and juicy, with slight charring on the outsides. The bangus was unlike any bangus I’ve had; very moist and fleshy. Almost like saba. The pork and fish are served with the much buzzed silog rice. And it is quite good. 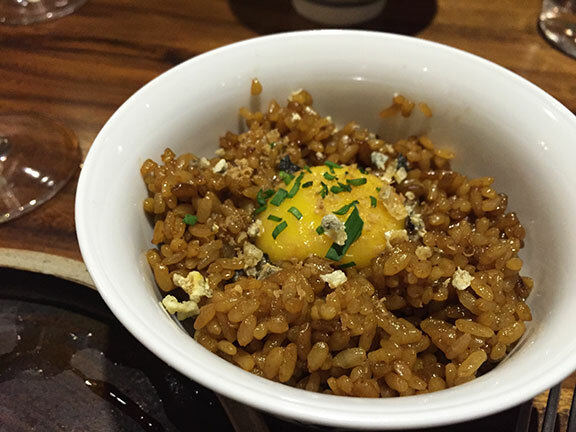 Plump Japanese rice tossed in a dark umami packed glaze and mixed in with chicharron bits and an egg yolk for good measure. The food up to this point is actually quite filling. Dessert was ambiguously listed as “sweets” but we were served more like petit fours. This out of this world cassava bibingka. 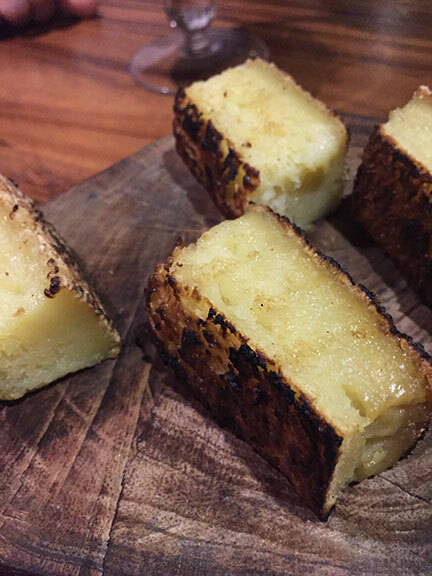 Very refined; pillowy on the insides and charred outsides. Only slightly sweet. 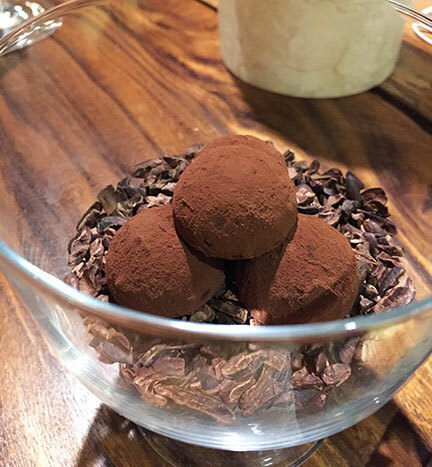 And these dark chocolate truffles filled with their version of salted caramel (made with patis) and served atop a pile of cacao nibs. Fantastic. Though we had brought wine, we ordered a few cocktails from the bar to cap off. I noticed a lean towards sweet and aromatic for the house mixes and thought it would be interesting to do a cocktail pairing with the menu as they do at Tippling Club. The bar is helmed by David Ong of The Curator. 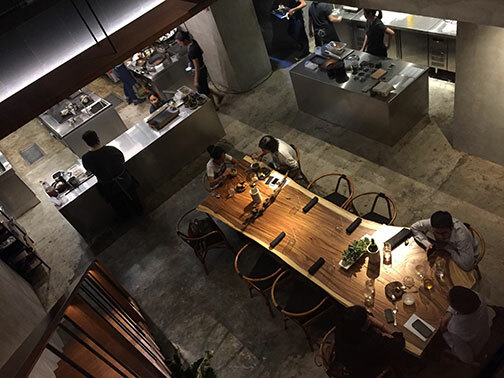 Chef Jordy Navarra is off to a good start with Toyo Eatery. Interesting edited selection of food. Great interiors. Attentive service. Though maybe a couple of visits and one could easily sample everything on the menu. But I’m sure there are loads of other dishes already stewing in Jordy’s head that will keep people coming back.